This year, I’ve stumbled across a number of Christian YA speculative fiction authors whose books are now among my favorites. To share these awesome books and celebrate Christmas, I’ll be giving away a new book each week until Christmas. 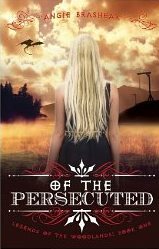 This week, I’m giving away a copy of Angie Brashear’s debut novel Of the Persecuted. This book’s title and cover art captured my attention the first time I saw it. Isn’t it stunning? The characters and the story world in this book are unique. The first sentence grabbed me, and I couldn’t put the book down after that. While this is an indie published book, I didn’t find any editing issues. If I hadn’t known that this was an indie book, I wouldn’t have guessed it from the quality of the writing. Definitely a book to add to the shelf of favorites! Personally, I go out of my way to support indie authors because I know they don’t have a publishing house behind them. What about you? When buying books, does it matter to you if they are indie or traditionally published? No, it doesn’t matter with me, Indie Author’s have to start somewhere to get noticed.